Hate Having To Pay For Facebook? Frustration Free Friday! Hate Having To Pay For Facebook? Facebook is a pain in the – well, you know. We have used it as a social meeting place, a community link and a business networking tool. But now, you may find yourself struggling to get your posts seen by anyone on a regular basis, but just hate the thought of having to pay Facebook to be visible. You can’t seem to find the sweet spot for what works when, or the rhythm to repeat any posting successes you may have. Guess what – it isn’t your fault. The fact is that there are more updates, with fewer being seen. 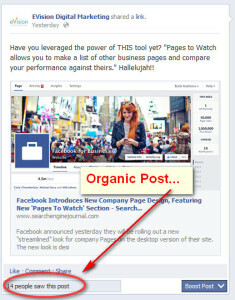 Organic reach is dropping like a stone. Bad for you, uber lucrative for Facebook. Promoted posts are here to stay. If you haven’t entered the pay-to-post arena, it’s time to figure it out. It’s here to stay, but how you leverage your spend will make all the difference in how successful your Facebook marketing efforts are. Promoting your business and generating an ROI for your investment is possible, as long as you know how, where, and how much to spend. 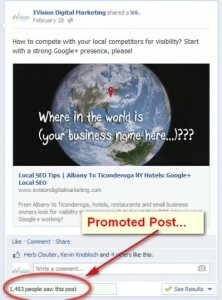 The first important item for any small business who wants to be successful on Facebook is education. You have got to understand what is happening and what will work best for you. Posting once or twice a week with a link and a descriptive post just won’t do it. No matter how much you hate it, Facebook marketing is now a business strategy that requires analysis, implementation and management. Take the time to explore what Facebook strategies work, and how best you can use them for your needs. At eVision Digital Marketing, we are always here to help with social media consulting, or hands-on management. Call (518) 222-6285 today for more information, or drop me a note.